‘This is the story of how to mess up a branch line’ said Alan Noble of the Lakes Line Rail User Group. Except he did not use the word ‘mess’. The Lakes Line branch that runs ten miles from Oxenholme to Windermere is one of those survivors of Beeching which has prospered and become an integral part of the rail network. Oxenholme is now known as ‘Oxenholme Lake District’, a recognition that hardly anyone using the service is going to the village itself, which is little more than a lofty suburb of Kendal. The railway only runs through Oxenholme, rather than the much larger Kendal which is the first stop on the branch, because the engineers of the Lancaster & Carlisle Railway did not want the expense and difficulty of routing the line through Kendal which would have required a two mile tunnel. The branch which opened in 1847 was famously seen as an affront by William Wordsworth and his fellow Romantic poets who were opposed to more people being attracted to their beloved Lakeland, particularly the sort who, unlike them, would fail to appreciate its beauty. The branch therefore never extended further along the lake or into the hills above, although at the bottom of Windermere there was the Ulverston & Lancaster railway, a branch off the Furness line which was built principally to give access to the holiday homes of the mine owners and factory bosses from Barrow. As with many unlikely survivors of the Beeching cuts, the line has thrived. It has become a vital part of the transport system of an area that is overrun by cars in the long holiday season that now stretches from Easter to October and quite possibly beyond. This year, according to all the business owners I spoke to on a visit in early August, has been a bumper time. Though the Americans who before 9/11 came in drovers have largely not returned, they have been replaced by the Japanese for whom the Lakes have become a must see because of its connection with Beatrix Potter whose books are widely used in Japan to teach English. The various Beatrix Potter attractions have become a honeypot for the Japanese who have been joined recently by increasing numbers of Chinese as more and more become affluent enough to make a trip to Europe. What these visitors, together with a growing number of Indians have in common is that a vast majority arrive by train, many from Manchester Airport, at Oxenholme and very few hire cars which means they are dependent on public transport. Stagecoach makes a lot of effort to provide regular services with their green double deck buses that are well advertised and the timetable is set out in an attractive booklet. So one would expect that given the importance to a key part of the so-called Northern Powerhouse would be to ensure that a regular and reliable train service would be provided on the branch. And there was. Until 2016. And since then there has been a deterioration, gradual at first, then rapid and finally total with the announcement in June that all trains along the branch would be cancelled, a decision that was rescinded after much protest. Noble and his fellow User Group activist, David Grime, are unequivocal about the main culprit – the Department for Transport. The troubles, they stress, start from when responsibility for the service of both the Lakes and Furness lines was shifted from being part of the TransPennine Express franchise to Northern. Grime and Noble have no idea why the line was transferred from TPE but see that as the root cause of the decline: ‘Someone at the DfT obviously thought it was a better fit, but they clearly had no local knowledge’, said Grime. For the Furness, this made some sense as Northern already ran services up the whole line form Lancaster to Carlisle which meant that there was a logic to taking over services that stopped at Barrow. 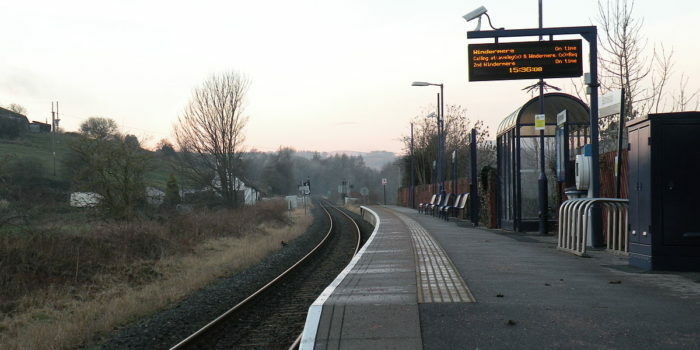 But for the Windermere branch, there was no such logic as it is an outpost of Northern, separated from its other services by the West Coast Main Line on which Virgin and TPE are the main operators. As a result, one of the consequences of the shift from TPE to Northern was that most of the services which went direct from Windermere to Manchester Airport were removed and instead most are either just shuttles or go through to Preston which is a far less useful destination. Virtually all aspects of the services have deteriorated. The rolling stock now consists mainly of tired old Sprinters rather than the far newer Desiros but it is the performance of the service that has been most damaging: ‘Under TPE’, Grime a retired quantity surveyor says, ‘the odd cancellation was the exception. Then there started to be more and from last December, the number really escalated’. Indeed, the user group has kept count recording 53 that month, which, after an improvement increased to 93 in March and a staggering 232, affecting all but four days, in May. On four successive days one of the key services, the so called ‘school train’ which leaves Oxenholme at 15 34 was cancelled leaving hundreds of school students stranded. Most of this was happening before the disastrous timetable change of May 20. Then, it got worse. On June 4, Northern announced that all trains on the line would be cancelled and replaced by a bus service to allow for driver training. So at the busiest time of the year, on a key branch line, Northern, now run by Arriva, expected users to drag their heavy luggage onto a bus which meandered through the local hills, taking far longer than the train which does the journey in around 20 minutes. The user group is convinced that this shows Northern simply does not have the management capacity to run the service as Grime explains: ‘There’s TPE trains running through Oxenholme all the time and it was a natural fit for them to run the branch. Northern are simply too far away.’ It was, therefore, logical for Northern to think that scrapping the Windermere service was the easiest thing to do in order to get more drivers trained. This was soon reversed, but only thanks to widespread protest led by the local LibDem MP Tim Farron and the intervention of West Coast Railways which ran a charter train service – funded to the tune of £5,500 – by the Department for Transport. It was hugely popular especially as the service was free and was supplemented by buses on the services it could not operate. The service has now restarted under the third iteration of the timetable since May but the user group is still greatly concerned that further cancellations are in the offing once the furore over the line dies down. The improvement that never came was electrification. In 2013, the government announced that the line would be electrified but when the cost overruns on the Great Western emerged, the scheme was scrapped. Originally it had been costed at a mere £16m but this had leapt to £35m and rising, though Grime is suspicious of exactly what was included in the new costing: ‘I suspect they included upgrading, such as having a passing loop in that total’. Apart from cost, the other reason given in dropping electrification was the fact that the posts would be unsightly. This is dismissed by the user group as fatuous nonsense as Switzerland, with its fantastic scenery, has an all electric railway that blends in perfectly with the landscape. Instead Windermere will get bimodes, the ex 319s from Thameslink which will be converted by adding a diesel engine, a solution that experienced railway managers feel is an expensive and short term compromise. Given the West Coast is electrified, having a ten mile branch that operates under bimodes seems incongruous to say the least. My wife and I took the train up to Oxenholme from Euston with our bikes which we had pre-booked with Virgin Trains. This is a service which is increasingly in demand and on our way back I had hoped to bring an extra bike, as I had purchased a beautiful vintage Harry Hall to replace my everyday bike stolen a couple of months ago. However, the return service from Oxenholme already had its complete quota of bikes – a princely four. As the poor bloke at Oxenholme complained, bikes are the bane of his life. He is always having to turn people away as the quota is full – as he put it ‘these Pendolinos were designed 20 years ago when cycling was far less popular.’ Yet the driving motor has far more room than four bikes – after all the other one has a whole kitchen in there – and it would not take much redesign to double that capacity or more. Yes, there is not much money in it for Virgin but a lot of goodwill and environmental brownie points. Meanwhile, if anyone is coming down from the Lake District and fancies bringing my bike, get in touch!! Though to ride it, you need to be a six-footer! Technically, too, I would not have been allowed to take the bike as apparently passengers are only allowed one bike each. This seems a nonsensical restriction. I am sure not many people end up with two bikes as I had, but there are likely to be exceptional circumstances, such as someone on a bike holiday getting ill or injured, and therefore needing their companion to return their steed. It is the sort of daft restriction presumably inherited from BR days that a commercial organisation should have the nous to scrap. I am sure not many people would abuse the privilege.